Knowledge is power! Welcome to the product knowledge page for all styling, cleansing and conditioning lines we carry here at The Style Lounge! Learn why we use what we use! Orders can be prepared for pick up. Please phone in or email me your orders for any styling or skin care items you are interested in purchasing, it's EASY! Most diverse sculpting lotion. Perfect for setting hair. Adds weightless moisture & shine. Lift, curl, sculpt, smoothe…. The best root enhancer. Gives ultimate volume that lasts all day. All hair types. Transforms the finest hair from flat to full! Weightless volume spray. Spray it from roots to ends. Gives texture without feeling sticky. Promotes healthy sheen. Sculpting foam. Adds mad volume! Leaves hair soft full and bouncy. Enhances shine. Thickens hair. Adds definition and separation. All hair types and styles. Ultimate curl enhancing cream. Works on all curls. Ringlet, bouncy, tight, loose, big small. Keeps hair soft. Perfect amount of hold. 50% Wax, 50% Hairspray. Hold, texture and shine. Gives separation and definition. Use responsibly, a little goes a LONG WAY!! Extra Strong Hold Hairspray. Session Workers favorite spray. Seen on the Red carpet to the pages of Vogue! Works wonders on fine or limp hair! 3 Hairsprays all in one! Just turn the nozzle to the desired strength. It’s as easy as 1-2-3! Soft, medium or strong hold hairspray all in one can! 3. Keeps the yellow out! 4. This is the best Blonde toning shampoo you will ever use!! radiance, color protection OKARA PROTECT COLOR combines an exclusive duo of natural ingredients proven to protect and enhance color-treated hair. Hamamelis extract, a powerful pigment fixing agent, captures and maintains color while Okara extract, a protein from the soybean, repairs and rebuilds damaged hair. This color protection system provides long-lasting, luxuriously vibrant hair color. Detangle and maintain hair color by up to 80% with this lightweight leave-in conditioning spray. It seals in color to help preserve vibrancy while UV filters guard against daily damage. Color is protected, hair regains softness and radiance. OKARA PROTECT COLOR is the first hair care system to include a Color Protection Factor (CPF), a measurement that evaluates the percentage of color protected when used in comparison to leave-in. Directions: Shake bottle well to mix the two phases. Spray on towel-dried or dry hair and comb through. Do not rinse. Proceed to styling. This highly protective shampoo is proven to maintain 70% of color vibrancy while enhancing its intensity and radiance. A gentle cleansing base ensures additional color protection and helps resist fading. Hair is silky, soft and luminous. OKARA PROTECT COLOR is the first hair care system to include a Color Protection Factor (CPF), a measurement that evaluates the percentage of color protected when used in comparison to another shampoo. Directions: Apply to wet scalp and hair. Work into a lather and then rinse. This rich, restorative conditioner is proven to extend the life of color by up to 80%. It deeply repairs and nourishes while detangling. Color is protected, leaving hair with long-lasting silkiness and incomparable luminosity. OKARA PROTECT COLOR is the first hair care system to include a Color Protection Factor (CPF), a measurement that evaluates the percentage of color protected when used in comparison to conditioner. Directions: After shampooing, remove excess water and apply in sections. Comb through; leave on for 2-5 minutes and then rinse. 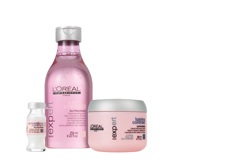 Intensify the shine and brilliance of dull hair. FIORAVANTI incorporates the Fioravanti complex, a combination of 11 plant extracts, which tightens the hair cuticles delivering a burst of magnified shine. Acerola Cherry vinegar neutralizes hard water and boosts strands with a high-gloss finish. This shine enhancing system procures radiant hair with light-reflecting shine. This shine-promoting spray detangles and hydrates hair by tightening hair scales to restore its natural brilliance without weighing it down. Directions: Spray on towel-dried or dry hair and comb through. Do not rinse. Proceed to styling. This powerful shine boosting shampoo removes dulling factors like residue and hard water to restore radiance to even the most lackluster locks. This time-saving formula instantly detangles, neutralizes hard water and prevents shine-blocking particle deposits along the hair fiber giving hair an iridescent, silky smooth and light reflective texture. Directions: After shampooing, remove excess water and apply in sections. Comb through; leave on for 2 minutes and then rinse. Basil has long been considered a sacred plant in Europe and India because of its healing power. The essential oil extracted from its leaves has deep cleansing and toning effects on the scalp, while the spicy and fresh aroma offers balancing qualities. This time-saving dry shampoo is a stylist’s secret weapon and a celebrity favorite. It instantly cleans hair without water to refresh and restore volume between regular shampoos. It absorbs excess oil, impurities and environmental odors so hair is lightly scented and full of bounce. Perfect for the gym bag, long flights, or the office drawer, this dry shampoo absorbs oil and other impurities in minutes leaving hair light and voluminous, without using water. It leaves hair lightly scented and refreshed while extending the life of regular shampoos. Use anywhere, anytime. Directions: Shake well before use and spray evenly 10 inches away from scalp and hair focusing on roots. Leave on for 2 minutes. Pat gently with a towel and then brush hair with a natural round brush. MYRRHEA ANTI-FRIZZ silkening system gently smoothes hair and eliminates frizz with an innovative and effective combination of natural ingredients. Myrrh extract, a smoothing resin, instantly smoothes and controls rebellious volume while Avocado oil delivers intense hydration. This exclusive formula provides unruly hair with infinite smoothness, silkiness and shine. The unique and effective formula of this smoothing fluid controls rebellious volume, eliminates frizz and protects against humidity and heat styling damage. Directions: Apply to towel-dried hair. Do not rinse. Proceed to blow-drying. For a perfect styling result, apply a small amount after blow-drying to dry hair. Naturally define voluptuous curls. ACANTHE PERFECT CURLS combines the curl enhancing properties of natural Acanthus extract (patent pending) with the hydrating benefits of Avocado oil to gently redesign curl contours and restore suppleness. Providing unsurpassed structure and elasticity, this curl enhancing system delivers perfectly shaped and defined curls. This lightweight leave-in provides body to curls, controls volume and eliminates frizz. Its silky fluid instantly defines and perfectly shapes curls with extra bounce. Directions: Apply a small amount to towel-dried or dry hair. Using your fi ngers, scrunch and shape curls. Do not rinse. Tips - A little goes a long way! Boost fine hair with high style volume. VOLUMEA volumizing care is infused with natural Carob extract that weightlessly coats and plumps each hair strand to deliver visible amplifying volume from the roots to ends. 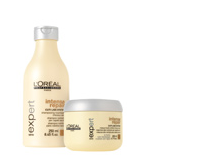 This volumizing system provides long-lasting airy fullness with enhanced body and bounce. A lightweight body-boosting styling foam pumps hair full of volume and adds structure to fine, limp hair. Hair regains natural and flexible volume from roots to ends that lasts all day. Directions: Distribute foam through towel-dried hair focusing on the roots. Comb through for even distribution. Style as usual. Do not rinse. Proceed to styling. Healthy styling for healthy hair. René Furterer styling products sculpt and set any style, from the most natural to the most elaborate, while maintaining healthy and beautiful hair. An exclusive anti-dehydration complex consisting of Cakile extract and Vitamin B5 procures shine, moisture and protection. These essential styling products can be used alone or layered limitlessly to achieve any style desired. Directions: Warm in hands, then apply to dry hair. Scrunch in or use to piece sections. Encourage healthy hair growth with plant-based, convenient formulas. As the specialist in long term strong and healthy hair, René Furterer uses essential oils, plant extracts and nutrients to combat the two types of thinning hair (hereditary and sudden). These convenient, patent pending formulas help to encourage stronger hair growth and improve the structure for thicker and faster growing hair. Directions: Apply to wet scalp and massage in, work into a lather and rinse. Directions: Use twice a week for the 1st month and then once a week for the 2nd and 3rd month. Step 1: Turn the cap all the way to the right to release the powder. Shake vial to mix the ingredients. Step 2: Apply with the applicator tip to a clean scalp. Massage into the scalp concentrating at the crown. Do not rinse. Proceed to styling. Directions: Use once a week for twelve weeks as needed. Carefully snap ampoule in a paper towel and place applicator tip on vial. Massage into scalp. Do not rinse. Proceed to styling. Beautiful hair only grows from a healthy scalp. 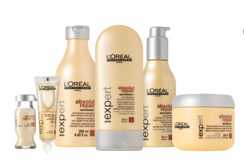 COMPLEXE 5 regenerating plant extract is the quintessential treatment in strengthening hair from the roots. Its unique concentration purifies the scalp and increases its microcirculation for healthy hair. A scalp massage with COMPLEXE 5 is the first step before shampooing to make all René Furterer treatments more effective. Directions: Use once a week. Apply to a dry and unwashed scalp. A warm sensation on the scalp may occur. Do not use on a sensitive scalp. Not recommended 3-4 days before or after an in salon chemical service. Not recommended for pregnant women. Step 1: Apply onto the entire scalp section by section. Step 2: Massage into the scalp and leave on for 5-10 minutes. Step 3: Shampoo. Vitamino Color and Delicate Color Shampoo. 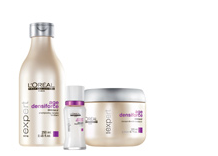 A complete salon system to preserve, protect and add shine to color-treated hair. A complete salon system that provides selective haircare treatment to brighten, repair and enhance the contrast of muti-dimensional blondes. A complete salon system to hydrate and nurish dry hair. A complete system to redensify, strengthen and protect hair weakened by passage of time. Skin Care Product Knowledge coming soon!